Japanese people place a high premium on personal appearance. Combined with plenty of disposable income, the typical Japanese consumer is able to dedicate substantial time and resources to her appearance. Beauty professionals reap the rewards of this interest and are well-compensated for their efforts. Smack in the center of a volcanic zone along the Pacific, Japan frequently endures low intensity earth tremors and occasional volcanic activity. There are four main islands and about 3,000 smaller islands. Destructive earthquakes occur several times a century. But the geography is not always unkind — natural hot springs are numerous and have been developed as resorts. One of the most densely populated nations in the world, there are nearly 860 people per square mile in Japan and about 78% of the Japanese population lives in an urban setting.A strong labor force of 67 million workers (40% of whom are women) propel the Japanese economy. A highly educated society, Japan has 0% reported illiteracy in people over the age of 15. While Japan is not rich in natural resources, its industrial, free market is the second-largest in the world. Japan is very competitive in areas linked to international trade, but must import many resources in order to sustain itself. The strong economy and the majority of people living in city settings allow typical Japanese consumers wide access to fashion, trends, and beauty information. Japanese people place a high premium on personal appearance. Combined with plenty of disposable income, the typical Japanese consumer is able to dedicate substantial time and resources to her appearance. Beauty professionals reap the rewards of this interest and are well-compensated for their efforts. Like many countries in the world, licensing in Japan is not required. According to Rika Kubo, advertising and marketing director for OPI Japan, “There are several associations that issue ‘certifications.’ Nailists need to take an examination and demonstrate certain skills to pass this certification.” One of these associations is the Japan Nailist Association (JNA). Aspiring nailists in Japan may attend privately owned schools where they take classes to prepare to pass a JNA examination. “There are several levels of JNA exams,” explains Kubo.“Level 3 is for beginners, and Level 1 is the highest level.” Receiving a California nail license is a high honor for a Japanese nailist.Many of the nail schools are run by techs who have come to California to become licensed. Armed with their certificates, most nail techs work in nails-only salons. 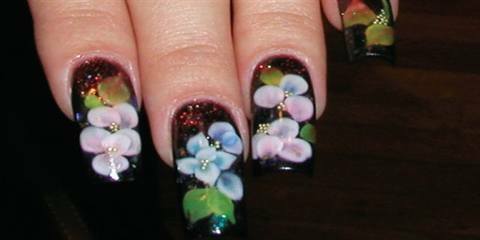 However, hair salons have started to add nail services to their menus. “There will be more full-service salons in Japan’s near future,” predicts Kubo. Professional products are sold through distributors in Japan. “Salon owners and nail technicians purchase professional products at special stores,” says Kubo. Consumers generally purchase nail polish, hand lotion, oil, and other products at department stores and nail salons.